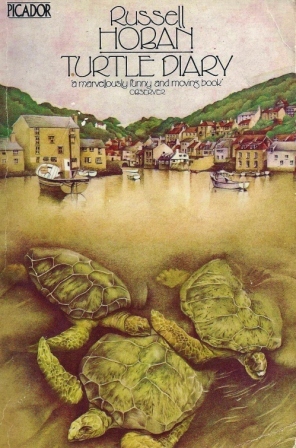 Turtle Diary by Russell Hoban ~ 1975. This edition: Picador, 1977. Softcover. ISBN: 0-330-25050-7. 191 pages. Well, abundant blessings to Russell Hoban. He faces up to and jumps the clichés quite nicely, and while his characters do ultimately find themselves in a different and presumably better emotional place, it’s not their ultimate fate to rest in each others’ arms. It’s so strange (and wonderful) that I picked up an old edition of this book completely at random some weeks ago, merely on the strength of the author’s name. And yes, I already knew who Russell Hoban was – what reading parent could not miss the identity of the originator of the adorably contrary Frances? And of course The Mouse and His Child, which is, most emphatically, not a book for small children, or possibly any age of child, despite the repeated references to it as a “children’s classic”. Whoever has designated it as such has perhaps not read the actual book. But I digress. As I was saying, I picked up Turtle Diary completely serendipitously, only finding out when another blogger mentioned that he too was reading it that it has been recently reissued by New York Review Books, and is currently receiving much popular press as literary readers “rediscover” Hoban-the-writer-of-adult-fiction. Guy states that this might well be one of his best books of the year. I know it will be high up on my own list. And on the strength of Turtle Diary, I will be searching out my copy of The Mouse and His Child, which I acquired when my children were small, thinking that it was a children’s story – it was, after all, shelved in the juvenile section of the bookstore. It was tucked away when an initial reading showed a deep unsuitability for the highly imaginative, nightmare-prone younglings of the household, despite the message of unconditional love yadda yadda yadda. Now that the children in question are in their advanced teen years and decidedly bombproof in their reading habits they might even be interested in exploring Hoban’s adult works for themselves. The dystopian Riddley Walker sounds like something my son in particular might enjoy; must seek that one immediately. Russell Hoban. If indeed his works are coming in for a time of resurgence, it is because they richly deserve it. Check him out. Thanks for the mention. I ordered another Hoban book. Not easy to pick one title but I selected Angelica’s Grotto. I’m glad you liked the book so much and that it hit the right moment and the right mood. Interesting choice. I’ll be waiting to see what you think of it. I think I’ll be seeking out Riddley Walker, and re-reading The Mouse & His Child, which I know I own…just need to find it! I hope Russell Hoban will have a resurgence! I loved Turtle Diary, but Riddley Walker is my favorite.